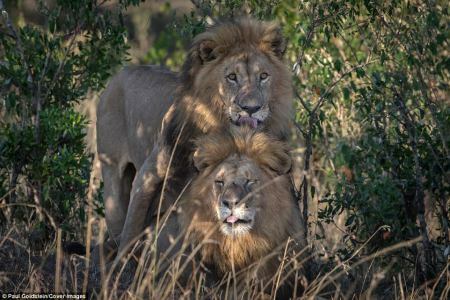 Two Male Lions were photgraphed getting intimate in Kenya’s Masai Mara and this shocked a lot of people, including the country’s ‘m0ral police’ who is now blaming G.ay men for the lions’ actions. The two male lions were seen engaging in a love-making session that lasted for at least a minute, which is longer than the usual time lions mate. Afterwards they were seen cuddling with obvious affection for each other. Dr Ezekiel Mutua, who is responsible for TV and film censorship in Kenya, saw the photo and said G.ay men who visit the national park are responsible for influencing the animals’ behaviour. He also called for the two lions in question to be caught and kept in isolation until scientists can “determine how they acquired homo$exual behaviour”. 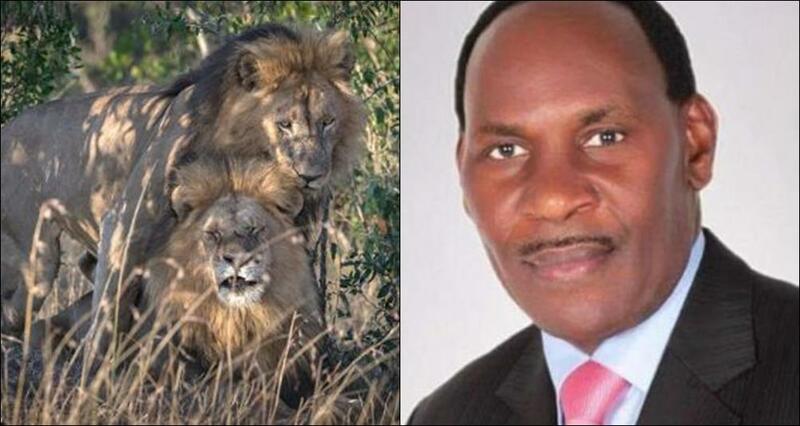 Homo$exuality among certain animals, including lions, has been observed for decades and is believed to be a natural occurence, but Dr Mutua is convinced that the only way the lions learnt that is either by seeing G.ay men having $ex in front of them, or the lions have been possessed by demons. He has now called for an investigation into whether the two lions were really male, though their grand manes make it really obvious. The images of the lions getting intimate were taken by London-based photographer Paul Goldstein during a trip to the Masai Mara. The lions had walked into some bushes to get some privacy and that was when Goldstein saw them. He said he first observed the two lions standing side-by-side, before one lay down and was gently mounted by the other. At one point one lion’s head was resting on the other’s. Mr Goldstein, a guide for Exodus Travels, says: “Sometimes you just see something that takes your breath away. I was guiding in the Masai Mara recently and we saw two impressive alpha males in perfect light. After a while they stood together, in perfect symmetry. What then happened was remarkable. I have heard of this happening in Botswana but with nothing like this vigour, and indeed at various zoos and safari parks, but incarcerated animals will do strange things, who can blame them. “This however was astonishing. I normally loathe any sort of humanising with animals and our documentary channels are full of it, but this was not only surprising but it was impossible not to smile. “When lions mate it normally last a few seconds, these two were at it for over a minute and the obvious affection afterwards was very evident, as opposed to the violent withdrawal when male and female mate. Homo$exual activity is not unknown among lions, especially males, and scientists report that some eight per cent of all observed mountings in the wild are male on male. Studies published in the 20th century indicated that about eight per cent of ‘mountings’ observed by scientists had been male lions with other males. Male lions have been observed courting other lions, including showing affection and caressing, as well as mounting. Lionesses are also known to couple up, however this has mainly been observed in captivity. Lions are not the only animal species where homo$exual relations exits. Biologists have recorded same-$ex $exual activity in more than 450 species including flamingos, bison, beetles and warthogs.